CEOs are judged by their performance over thier tenure. But what exactly, are the criteria used to determine HBR’s list of The Best Performing CEOs in the World? They are rated by a combionation of things including their companies’ environmental, social, and governance (ESG) performance, along with financial returns (return on equity adjusted for exchange rate fluctuations). 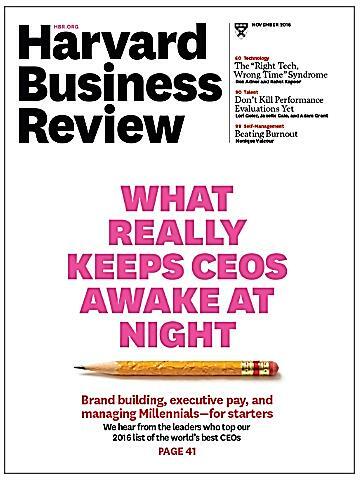 The accompanying article in the HBR report is interesting in its own right (the three CEOs interviewed, Martin Sorrell, Pablo Isla and Lars Rebien Sørensen have a lot of intriguing things to say about executive pay, brand building and Millennials) I thought the most intriguing nugget coming out of the conversation was how few of the hundred Best Performing CEOs were women. Very few. Damn few. In fact, there were only two. That means only two percent were women if my dusty math skills are correct. How is that possible? No real answers are given except by Sorrell, who mentions that women don’t get the same opportunities as men. But the conversation was dropped after that. As you may recall from one of my earlier blog posts, males also happen to dominate startups. Only four out of CNBC’s fifty “top disruptors” were women. All I saw was row after row of males. There were but three exceptions… So this the next generation? This is the virtually all-male future of the business world? What’s up with that? Look, I’m not a statistician, but even I can recognize a statistical anomaly when it stares me right in the face… Very few CEOs in the Standard & Poor’s 500 are women. Most of us could have guessed that. But I was shocked to find that they represent only 4.8% of chief executives. Why so? And what can be done about it? This inquiring mind, at least, wants to know.